In this article, I am going to explain how you can save a significant amount of money and time by using a recently updated, free software tool that you can download and install right now. Several years ago, I reviewed a piece of software named Invoice21 developed by RailTech Software Systems. This is an updated review since a few things have changed over the years. One thing that hasn’t changed is that owners of railcars often must pay a significant amount of money to just get detailed copies of railcar repair invoices. If you want to know how to avoid these fees, keep reading. Railcar owners often pay $600 per year (or more since the charge is per each profile ID) for detailed PDF copies of their railcar repair invoices. Some contract repair shops may provide easy to read, detailed invoices for no charge, but railroads are not required to do this; they are only required to provide the invoice cover sheet (Rule 112.G.7.b). Plus, if a railcar owner asks a billing party for a detail repair invoice, the billing party may charge a $150.00 per invoice fee (Rule 113.1.d). Finally, third party companies (i.e. fleet management services) wishing to receive the PDF report on behalf of customers must contact Railinc for a quote. There is a text file that is provided for no extra charge that contains all of the invoice details, but this file is very difficult to read. Invoice21 by RailTech Software Systems will import the file that is provided by the rail industry (Assocation of America Railroads – AAR and their IT team, Railinc Corporation) through the Car Repair Bill Data Exchange (CRBDX). CRBDX is a system where repair shops submit bills of railcar repairs which are then sorted and sent to the billed party for the equipment via text file and/or PDF. The text file is not-so-affectionately known as the “500 byte file”. The charge for this file is buried in the annual per railcar fee that the owner is already paying to register it with AAR/Railinc. This file is difficult to read because it contains 4 different types of records and is formatted for machines to read not people. Installing the tool is still a multi-step process and is a bit more involved than your typical software install, but if you follow the instructions closely, you shouldn’t have a problem and will be using the tool within 15 minutes or less. See this article for detailed installation instructions. If you do run into a problem, RailTech Software Systems will help for no charge – how to get in touch with them is clear on their website. I installed the program on my Windows 7 PC with no difficulty. After installing the tool, I imported a fairly large monthly 500 byte file (1,024 records) in only 20 seconds. To import a file, click on the Utilities menu and then browse for the file on your PC. Invoice21 will save only one month’s / one file worth of data at a time. It will erase the prior month / file before importing a new month / file. If you want to maintain more history, you will need to look at the Rail21 system, which requires a maintenance fee that is listed on the RailTech Software Systems website. 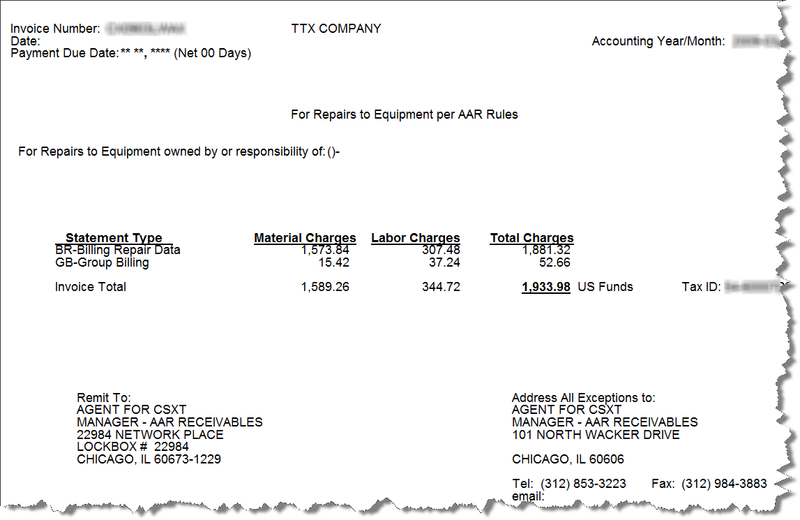 Invoices – summarizes the repair charges in Material and Labor. Group Billing is separated. Statements – shows the billing repairs by invoice broken out by railcar. Group Billing – shows the group billing by invoice broken out by railcar. Detail BRC’s – shows the individual railcar repairs broken out by job code. You will be given an opportunity to filter the reports before you display and print them. Invoice21 does not provide the ability to export your reports directly to PDF. For that you will need to have a utility that enables you to print-to-PDF. There are several of these available for free such as PrimoPDF. When you do click the print or print page buttons while viewing a report, it will send the report to your default Windows printer without prompting. Weight Calculator that accepts dimensions of lumber, steel, iron and chain and spits out the estimated weight in pounds. Overall, Invoice21 provides an pretty easy solution to the sometimes frustrating and expensive need to see the details of a railcar repair invoice. The installation has been simplified, but it continues to be a bit more difficult than other freeware. Although for the price of free, this is a small complaint. The interface is looks a bit outdated, but again, the value that it provides is solid. To import the file and display reports, the interface is fully adequate and not confusing. When I had a few questions about the tool, I left a message on the main number on the website and got a call back within a few minutes. I hope that you have found this review beneficial. Please comment if you have tried this tool and let me know what you think.